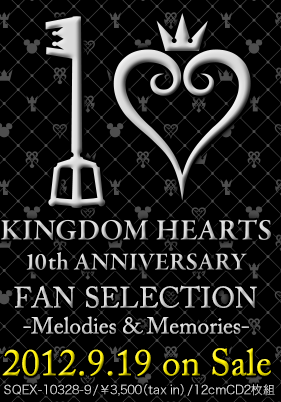 Square Enix has announced a special soundtrack for the Kingdom Hearts 10th anniversary entitled “Melodies & Memories”. The best part of this soundtrack is that us, the fans, can choose what songs to be featured on the CD! Simply head over to this website and you can choose songs from any of the Kingdom Hearts games! The soundtrack will go on sale in Japan on 9/19/2012 for 3500 yen (about $44).